Celebrate the influence of Brazil on gardens, arts and culture, and conservation. All season long, you can Go Brazil! Look for vibrant foliage, contrasting textures, and sweeps of color, from the silver leaves of Bismarck palms to towers of burgundy bromeliads, in the gardens. Learn more about the bold garden design and art of influential Brazilian Roberto Burle Marx. Brazil in the Garden: This is what vibrant looks like. See bold and beautiful designs inspired by Brazilian Roberto Burle Marx and tropical plants not normally seen in the Chicago area from the entrance beds at the Visitor Center to the Circle Garden to the Regenstein Fruit & Vegetable Garden. Sharon Heliconia ‘Sharonii’ is one of the more rewarding Heliconia. The brilliant red-orange “lobster claw” flowers go from April to September, each one lasting three months. That red-orange we think of as the flower is actually a bract, a protective covering for the true flower inside, which is pollinated exclusively by hummingbirds in South America. Inspiration Passion Flower Deep violet to lavender flowers in the most fantastic, out-of-this-world shape are produced throughout the year in mild climates or during the summer when used outdoors in Chicago-area landscapes. 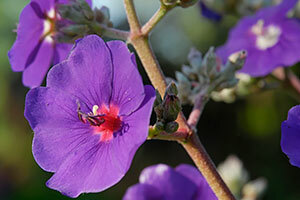 Sprawling and climbing to about 5 feet in height, this cultivar is small enough to grow in a container. 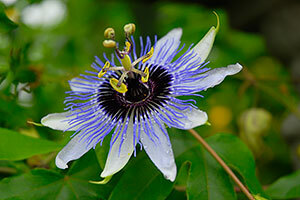 In the tropics, the leaves of passion flowers are the preferred food plant for butterflies. Glory Bush A native of Brazil, glory bush is one of the plants recommended by famed twentieth-century landscape architect Roberto Burle Marx—also a native of Brazil. Burle Marx transformed mid-century landscape architecture concepts with his dramatic, broad sweeps of tropical plants with colorful foliage and flowers, and his free-form water features. 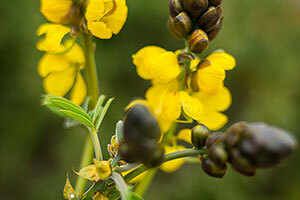 Popcorn Bush Deep black buds open to bright, 2-inch yellow flowers on 1-foot spikes on this nonhardy African shrub. The green compound leaves (more than one leaflet per leaf petiole), when crushed, smell like popcorn. Plant this tropical-looking plant in full sun and provide room for its rapid growth rate to around 6 feet in a Chicago summer. Additional support for Brazil in the Garden generously provided by the Helen V. Froehlich Foundation and Klaff Family. 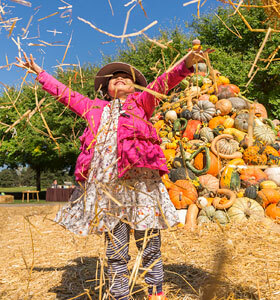 Shop, eat, drink, play, relax, celebrate the season with the whole family at the Garden.